I've been doing quite a bit of crocheting lately. This is the start of my latest project. I first saw the photo of this blanket on Pinterest and then pinned it to my Pinterest page. I kept looking on line and finally found that the source of the blanket is on a blog called buscandocomienzos. The blog is in Spanish, and I know just enough Spanish to ask how long you've been here and how to find the bathroom. (OK maybe a bit more than that.) Using translator (which is always an adventure) and the photos, after some trial and error I was able to figure out the decrease stitch where the grannie squares join. I really love this blanket, and it is going together pretty quickly. I love working with all of the colorful yarn. I hope you are stitching today. This is the Road to Triumph Ranch block that I showed in my post reviewing the Jennifer Chiaverini book Sonoma Rose. I have had a couple of requests to do a tutorial on how I made these blocks. You can use any 2 1/2" wide strips. You need an equilateral triangle or another way to measure a 60 degree triangle. The center hexagon is 1". Put 2 of the 2 1/2" strips together and cut a 4 1/2" section. Sew together along the long side. Place the center line of the ruler on the seam line and the 3 1/2" line along the bottom edge. Sew the six sections together, and then sew a 1" hexagon over the center of the block. I turn the blocks over and cut away the bulk where all of the seams come together in the center. I'm auditioning a different setting fabric. These blocks go together pretty quickly. I'm not sure whether I'll make a small quilt or a table topper. Hope you are doing some stitching this weekend. A couple of weeks ago I was contacted by Dutton Publishing to see if I would like to receive an advanced copy of Jennifer Chiaverini's new book, Sonoma Rose, to do a book review. It will be available in bookstores on February 21, 2012. Of course I jumped at the chance. 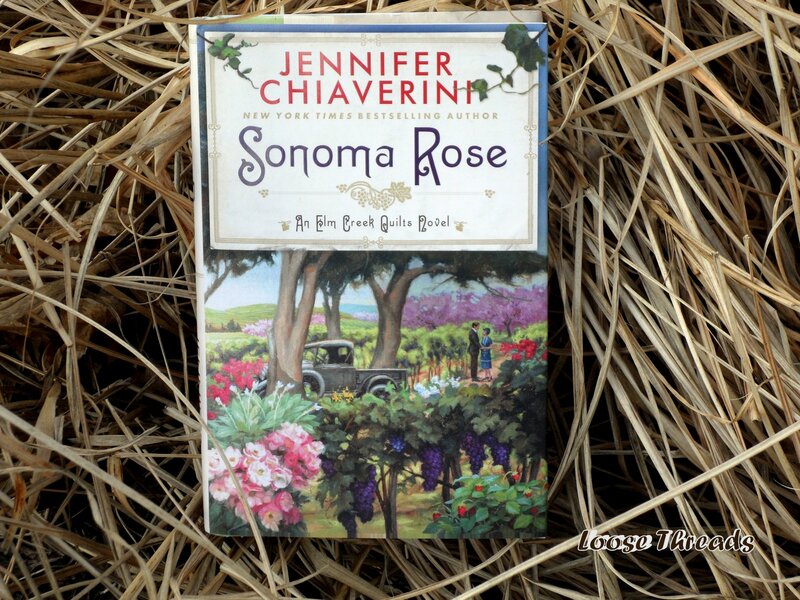 I have enjoyed Jennifer's books about the Elm Creek quilters, and Sonoma Rose is no exception. This book is historical fiction about Rosa and Lars who were first introduced in The Quilter's Homecoming. Sonoma Rose is a more in depth look at these characters. This story takes place during Prohibition. Rosa's husband, John, is an abusive man, and when she discovers that he is involved in bootlegging she finds an opportunity to take her four children and run away. Two of the children have a mysterious illness, and Rosa along with her true love, Lars are on the run. Rosa, Lars, and the four children head for San Francisco to see a doctor that can find a cure for the children. From there they travel on to Sonoma County where they assume new identities and build a new life. And....are there quilts in this book? Well, of course. Rosa has a quilt that was her great grandmother's wedding quilt. 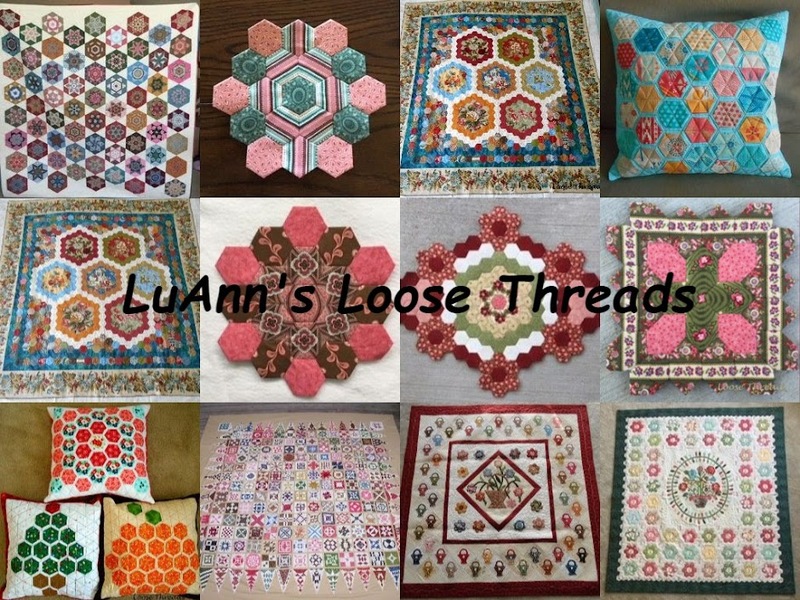 The pattern in the quilt is called The Road to Triumph Ranch. There is a drawing of the block inside the front cover of the book. Even though I know that Rosa's quilt is made from totally different fabrics, I just couldn't resist making a couple of these blocks in Kaffe Fassett fabrics. I hope you will pick up a copy of Sonoma Rose and enjoy the story for yourself. By the way, Jennifer's next book is called The Giving Quilt to be released in October 2012. This book is set in contemporary times as the Elm Creek Quilters have a special week at quilt camp to make quilts for Project Linus. I can't wait for this one. I hope you are finding some time to do some stitching and reading today! Thanks for stopping by and thanks to Dutton Publishing for the advanced copy of Sonoma Rose! This string quilt is made in much the same way as I did the heart table mat from my earlier post. These blocks measure 8 inches. Here is a close up of some of the blocks. I've used all shades of red; anything goes. For the background I used any string that had a light or neutral kind of background. You can see some backgrounds with red and green mixed in. I love using EQ5 to draw quilt designs. I was planning to machine quilt this along with the heart table mats for Valentine's Day, but my sewing machine had to go to the repairman. There's always next year. I hope you are all having a Happy Valentine's Day. I've finished my Scandinavian Hearts Tablecloth top. This was a lot of fun to make, and I really enjoyed doing the redwork. I think this one would be a lot of fun to hand quilt. I was going to make this red and green but decided to use mainly red so it could be used at Christmas and right on through February for Valentine's Day. Each corner has a different redwork heart. I had to redo one of the hearts because I was so excited to start this project that I didn't put it on point. Not sure what I'll end up doing with that...either a cushion or the center of another project. I hope you're all having a good day and doing a bit of stitching. 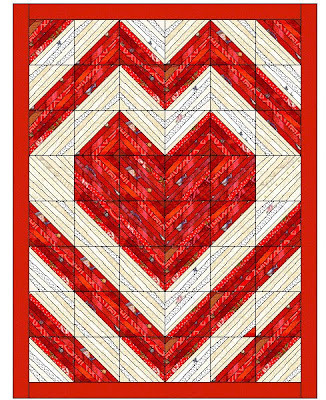 Here is another way to make the Heart Table Mat that you saw in my last post. I know a lot of you aren't convinced that you want to try making string blocks, and others of you just don't really like them. 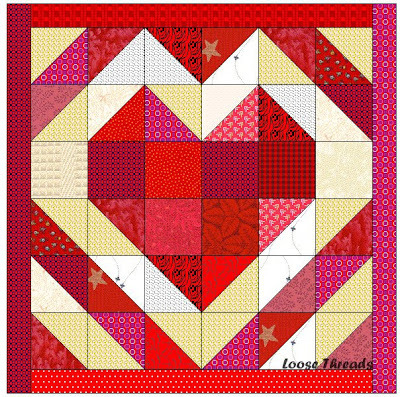 So here is an alternative to make the Heart Table Mat without making a single string block. This version uses squares and half square triangles. It's really quick and easy to put together. Cut 6 red squares 3 1/2"
Cut 2 background squares 3 1/2"
Your table mat (or wall hanging) will finish at 18 inches. Here is the EQ5 drawing. It's a little easier to see the placement on this diagram. I hope you're all stitching this weekend. Here is my tutorial to make the Heart Strings Table Mat as promised. It finishes at 18 inches. This is my basket of backgrounds and reds that I used. I also have some odd triangles in there. These are helpful to cover a corner sometimes. I recently helped my daughter move, and I was thrilled to find a phone book in her things. This is the best foundation paper that I've found to use. It practically perforates itself and is very easy to remove. I cut my foundations for this project at 3 1/2". Cut 36. (Recently I've been noticing that some of the big box stores (like Meijer or Wal-Mart) and even some grocery stores have phone books available right inside their doors. This 3 1/2" piece of paper is just a guide. You need to make sure it is covered...but not exactly. It will be trimmed down to size later. I started by putting right sides of a red and a background strip together. I "aimed" my sewing line to go down the diagonal center of the foundation. One thing I love about making string blocks is that this isn't an exact science. Take a look at the curve in my white strip in the photo below. Also notice the width of my red strip. As it is, that red strip will take up too much of that little block. Instead of cutting it down, I'll just move the next red strip over so that the first strip doesn't show so much. Chain piece these through your machine. Here is the pile of 36 blocks ready for pressing. Continue sewing and pressing until you have covered all 36 blocks. Then place the 45 degree line on the seam line between the red and white strip as shown below and trim. When you are trimming the one color blocks, just place the line on one of the seams so that all of your strips run at a diagonal. I just chose to make my blocks 3 1/2" (unfinished) because that is the size of the alternate blocks in the Bonnie Hunter Orca Bay mystery quilt from earlier this year. I really like this size string block. Here is the layout of the blocks as I drew them in EQ5. This is the finished top put together. I really hope you will give string blocks a try. If you have any questions, please leave a comment or email me at krugla@gmail.com. If you still want to make this little table mat and don't want to use string blocks, I'll show you how in my next post.